Everything is Better in a Bacon Bowl! Who doesn’t love crispy, tasty bacon? 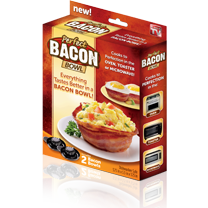 Now you can make every breakfast, lunch, dinner, or dessert more exciting with the Perfect Bacon Bowl! Just wrap bacon strips around the mold, cook in the oven, microwave, or toaster and serve up tasty meals and snacks right in the cooked bacon bowl.